The naitional banner o Nepal (Nepali: नेपालको झण्डा) is the warld's ae naitional banner that is non-quadrilateral in shape. The banner is a simplified combination o twa single pennons, the vexillological wird for a pennant. Its crimson red is the colour o the rhododendron, the kintra's naitional flouer. Red is an aa the sign o victory in war. The blue border is the colour o peace. Till 1962, the banner's emblems, the sun an the crescent moon, haed human faces. Thay wur removed tae modernize the banner. The faces remained on the sun an the muin on the Ryal Stanudart till the abolition o the monarchy in 2008. The banner wis adoptit, wi the formation o a new constitutional govrenment, on December 16, 1962. The individual pennants haed been uised for the precedin twa centuries an the double pennant syne the 19t century. The banner borrows the basic design frae the oreeginal Hindu design, which haes been in uise for mair nor 2,000 years. 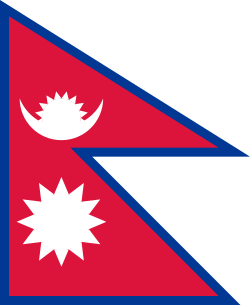 Wikimedia Commons haes media relatit tae Flags of Nepal.